The Ghost Echo is our spooky take on the haunted* amp-top spring reverberation units of yesteryear. This creepy analog/digital spring reverb emulation machine boasts a terrifying 30ms – 150ms of pre-delay, controllable via the “Attack” knob, for everything from a quick rockabilly slapback, to viscous pools of ectoplasmic reverberations. When playing staccato, you’ll hear the tortured trails of the reverb, resulting in more of a slapback, or echo sound. Legato playing will reveal a massive ambient “depth” that fattens up the sound – and look out it’s right behind you! Phew, that was close. The “Dwell” control sets the length and thickness of the decay, which is to say that it controls how long the disembodied spirits of notes no longer with us float through the ether; and the “Depth” sets the intensity of the reverb, which you probably know as the wet/dry mix, but we like to think of it more as how scary the overall effect is. 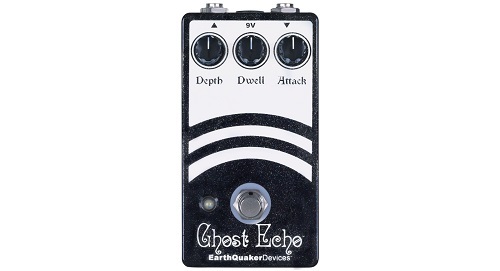 The EarthQuaker Devices Ghost Echo is true bypass, and built one at a time by a team of friendly ghosts in the never-ending hall of funhouse mirrors that is Akron, Ohio, USA. *Not actually haunted. Or are they? Dwell: Adjusts the length and thickness of the decay. Attack: Sets the delay of the pick attack on the wet signal from 30ms-150ms.